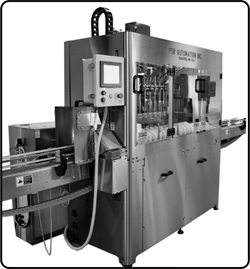 The F3000-CM Servo Filler is an extension to the F3000. The system contains similar features, but includes the ability to fill containers while they are moving, reducing the cycle time. This allows the machine to reach speeds comparable to a rotary filler, but only requires a minimal set of change parts and has a quick setup time. 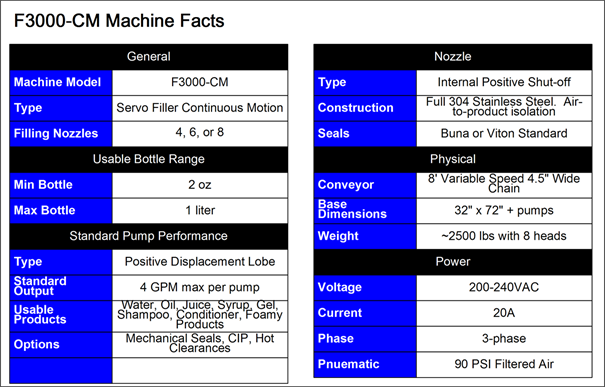 Standard F3000 features, such as diving nozzles, pump acceleration / deceleration, and automatic height adjustment makes this a versatile, yet high performance machine.